A thin layer of raspberry or black currant preserves, sandwiched between two delicious almond cut-out cookies. In a large bowl, beat together butter and sugar with an electric mixer, until light and fluffy. Add egg yolks, one at a time, then add lemon zest and vanilla extract. In a separate bowl, sift together flour, cinnamon, baking powder, and salt. Stir in ground almonds. Gradually add the dry ingredients to the wet, until fully combined. Divide the dough into two balls, wrap with plastic and rest in the refrigerator for one hour. Preheat the oven to 350 degrees. Grease or line two baking sheets with parchment paper. Set aside. On a lightly floured surface, roll out dough balls to 1/4 inch thick. Use a 2 to 3-inch round cookie cutter to cut out dough. Place cookies about 1-inch apart on prepared baking sheets. Use a smaller cookie cutter, (3/4 to 1-inch) in the shape you desire, to cut out the centers of half of the cookies on the baking sheet. These will be the tops. Bake for 10-12 minutes or until lightly golden. Remove from oven and place on a wire rack to cool completely. 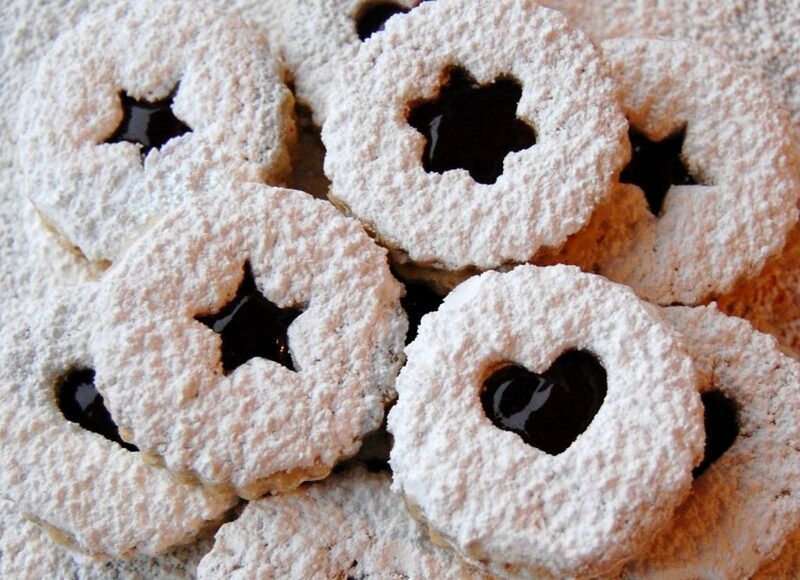 Place a small dollop of jam on each solid cookie. 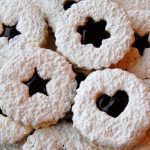 Dust each cut-out cookie with confectioner's sugar and gently place on top of the solid cookie with jam, and sandwich the two together.